I have just uploaded a new video that details the process of relocating SharePoint databases in SBS 2008 using the inbuilt wizards. <img src="http://lh6.ggpht.com/-xzaNFFI1O54/URCD11N-q3I/AAAAAAAAIP0/CnQ9IL1u-R4/video52857ead7665%25255B5%25255D.jpg?imgmax=800" style="border-style: none" galleryimg="no" onload="var downlevelDiv = document.getElementById('6e26d74b-d5c0-4678-9136-05c6309cfb3c'); downlevelDiv.innerHTML = "
All new videos will be now be available at http://www.youtube.com/directorciaops. The videos that I have already created for Saturn Alliance will remain but will no longer be updated or maintained. I therefore encourage all previous subscribers to update to my new directorciaops channel. Frank: The man on the tape wasn’t specific. I have decided to finish up with Saturn Alliance on the 30th of September 2008. From that point forward you can contact me via director@ciaops.com (and via http://www.ciaops.com). As such I have also created a new YouTube account where I will continue to post videos. This new location is http://www.youtube.com/directorciaops. The videos I have created at http://www.youtube.com/saturnalliance will remain, however all new videos will be uploaded to the directorciaops account. If you are an existing subscriber I hope that you’ll subscribe to my new account. My plans at this stage are simply to take a break and then pursue some opportunities in the areas of Sharepoint and IT productivity consultancy. I take this opportunity to thank all those people who have supported me and Saturn Alliance during my time there and I aim to maintain a close relationship with Saturn Alliance going forward, however I do need to make a change. I’m looking forward to a new world of challenges which I will continue to post here. You may change other things but blogging must go on! So as Frank would say – “Hoochie mumma”. So I’ve been doing some more work on my Windows SharePoint Services Operations Guide (WSSOPS – plug, plug, plug…) and have come up against something that doesn’t seem right. Now I’ve been testing the migration from Sharepoint Services 2.0 with the database instances upgraded to SQL 2000 Server across to SBS 2003 (and SBS 2008) and this seems to work without issue (as long as you disable Full-Text Indexing first). So now what happens if I install Sharepoint 3.0 on the original SBS 2003 server that contains Sharepoint 2.0 that has had its databases upgraded to from WMSDE to SQL Server 2000? I completed the “standard” side-by-side installation as recommended by Microsoft. 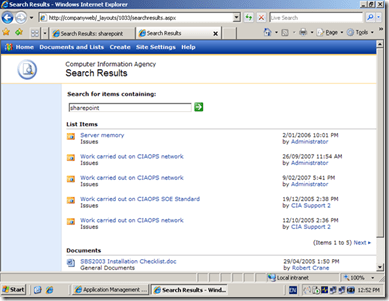 I then ran a search in Sharepoint v 2.0 (a.k.a Companyweb) and as you see it still works. So now I do a search in Sharepoint v 3.0 also installed on the same SBS 2003 box and guess what? isn’t correct because both search services (Sharepoint 2.0 and 3.0) appear to function on my test SBS 2003 server even after installing Sharepoint 3.0. In an attempt to understand where this “limitation” has come from I have asked my local resident SBS-MVP (Wayne Small of sbsfaq.com) if he can (or find someone who can) explain what I seem to be missing here. If anyone else out there knows why this “limitation” has been highlighted in the Microsoft documentation I’d appreciate you letting me know as I really can’t see it as being a limitation, but then I am probably missing something obvious (as I have done many times before). 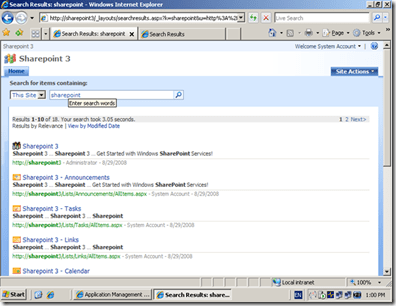 I would be disappointed if people read this and decided not to install Sharepoint 3.0 on SBS 2003 because they had upgraded their instances and were afraid Sharepoint search wouldn’t function as I have read a few comments on the web to this extent. Help me understand – I need to know! No? Neither would I, however they are still out there doing stupid things. Such as? This story from the Sydney Morning Herald details how a server the bank sold on Ebay still had confidential client information. Um, like how is that supposed to happen? An “honest error” and an “isolated incident” according to the bank. Yeah, right. Being involved in recycling technology myself for worthy causes I can’t tell you how much “interesting” data I have found on machines individuals and businesses have donated. Now I make sure that every machine that I recycle has its information thoroughly wiped to military standards before it is resold, so if I can do that why can’t the bank? It is simply a matter of booting to a CD and allowing to run an erase program. Still, it amazes me how little people value their information. The problem is, think of all the establishments that have information about you stored somewhere on computer. What do they do with their old systems? Do they have a data destruction policy? What about your home PC’s? What happens after they have served their dues? Do you just throw them out? Ah, what about the data? It doesn’t suddenly become unreadable just because the PC is a little slow. Value your data. If you want to keep it private – encrypt it. When you are finished with it – wipe it for once information escapes your control all it wants to be is free and like a genie, it doesn’t care who its master is! The real worry is those businesses who “look” after your data. What do they do? If you feel uneasy I’d ask them. If you haven’t got your head “into” cloud computing yet then be prepared to go the way of the dinosaur, because those savvy users are already well down the path to implementing it without you! Now, not everyone is going to need to convert all their Office documents to Office 2007 format but if you are taking the leap and upgrading all your desktops to Office 2007 it is probably an option to consider since there are many benefits with the new format. Rather than opening each document and saving it in the new format you can download some tools from Microsoft and automate the process. Follow these steps to complete the process.